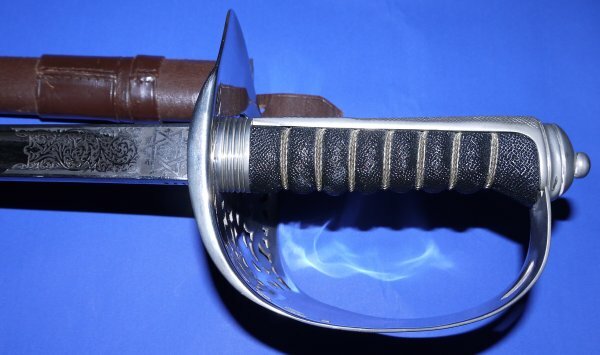 In good condition, an Elizabeth II British Infantry Officer's Wilkinson Sword. 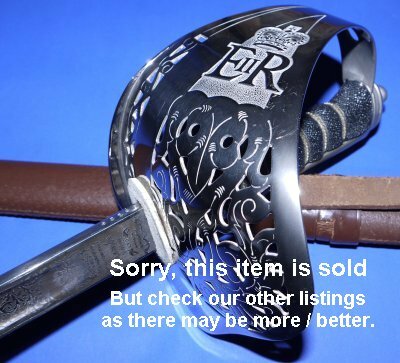 Serial number 83183 for 1961; it is costs £10 with Royal Armouries to get a copy of the original buyer of each Wilkinson Sword (there are some blanks / gaps) if of interest to a buyer. 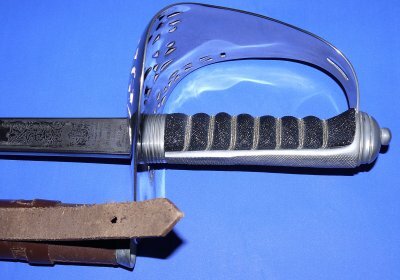 The 32 1/4 inch blade is in a little aged / worn condition but still very good and firm in the hilt. The plated hilt very good save for a patch of small scratches. The faux fishskin grip and twisted grip wire bindings are good. The leather field service scabbard with some age and wear, but good. The sword sheathes and draws well. These ERII Wilkinson infantry swords are getting harder and more expensive to source, so invest now! A nice price at £? (too late, now sold). Please quote item reference number R40 (0521). Further / large images available upon request.